Welcome to our September Block of the Month! I’m Designer/Radio show host Pat Sloan! 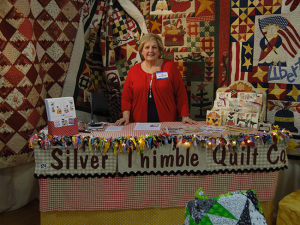 Our September Designer is the dynamic, energetic and oh so talented Pat Wys of Silver Thimble Quilt Company! I first met Pat when her group invited me to teach. We ventured to the suburbs of Atlanta, Georgia and I felt like I was ‘home’. Pat and her friends put on a feast for my husband and I, including a full array of southern cooking (including labels) so we ‘northerners’ could have try it all! 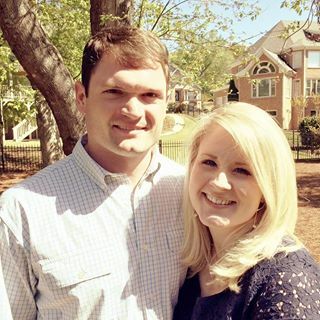 Let’s get to know Pat! I was an Art major in college. I took several art history classes and began an interest in quilting through learning about fiber arts. 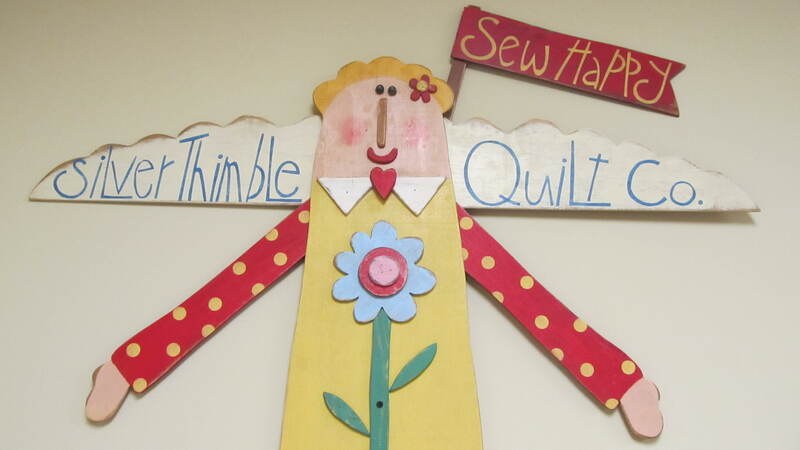 I was always sewing but in 1979 we built our first home and I took a class in quilting. That was the beginning and end for me. I WAS HOOKED and never looked back. 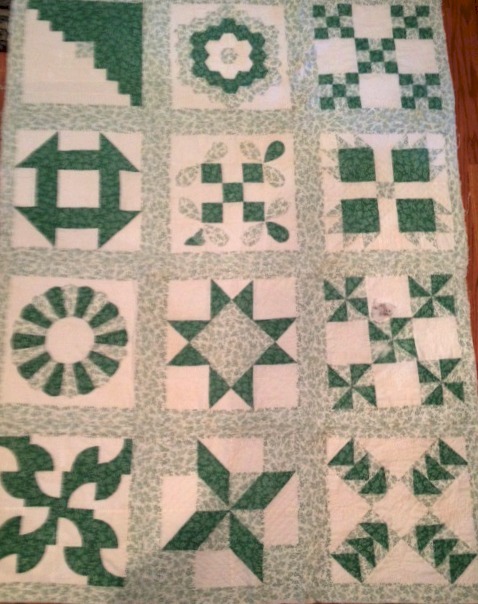 I do have the first quilt I ever made and I show it when I speak at guilds around the country. This quilt has holes in it from so much use! It is ENTIRELY hand pieced and hand quilted. When I took my first class to make this quilt there were 4 choices of fabric color for the project. The same fabric just different color ways, red, green, blue and brown. We made templates from file folders back then (when dinosaurs roamed the earth!). There were no rotary cutters, mats and half the other goodies we use to quilt with today. 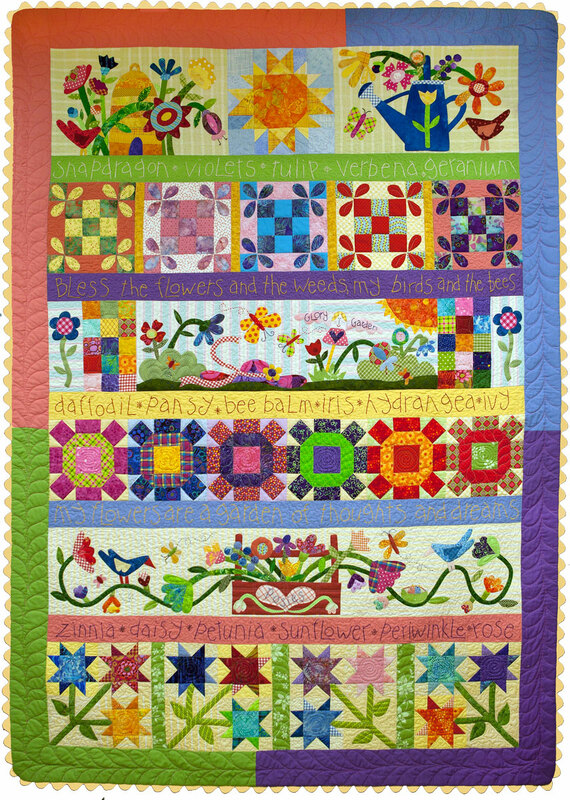 I am so glad that I have watched the huge resurgence in the popularity of quilting. I am also pleased that I learned the “basics” the way that I did. Without doubt my eye is drawn first to quilts that have appliqué. From fine applique to chunky and modern. I love appliqué! 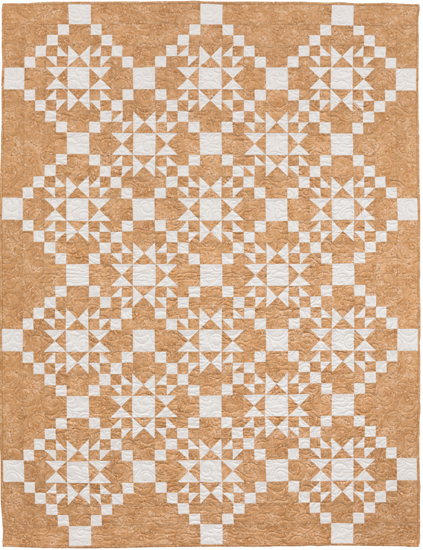 My preference would be folk art appliqué quilts. 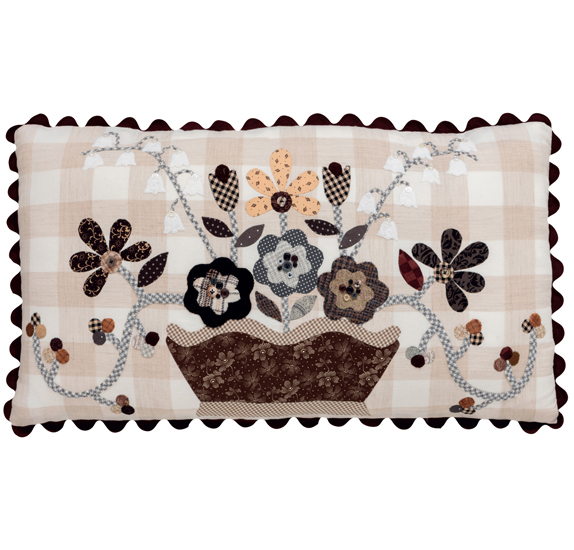 Folk Art applique has a huge range of possibilities in design and fabrics. The sky is the limit. I also say, as a designer, nothing puts your stamp of originality on a quilt faster that the addition of appliqué. It is a chance to show personality. Appliqué says “I was here I drew this motif! We all have parts of the process we ‘prefer’ more than others. 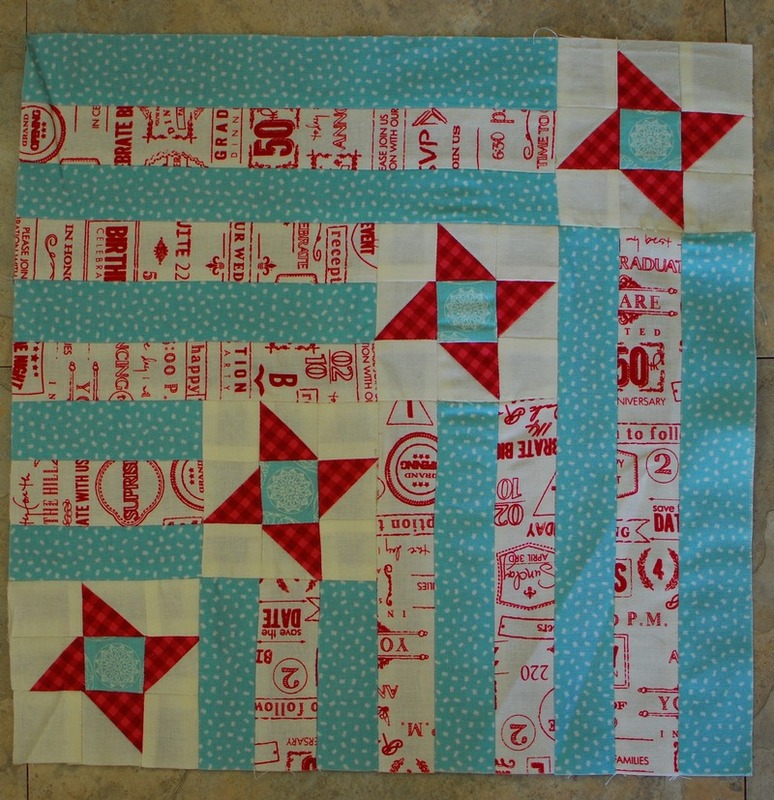 What part of quilt making do you ‘Prefer’… least? Brace yourself! I love to pick out fabrics for a quilt. I love to “audition” fabrics and imagine what they will look like in my designs. Shopping for fabric is all part of that process too! Who doesn’t love to shop for fabric? As far as the least favorite part of a project. I don’t like waiting for my quilt to come home from my long arm quilter Leisa Wiggley. She is an artist in her own right and I can’t wait to see how she compliments my designs with her artistry. My quilt is transformed! Oh yes, I was a Kindergarten and First Grade teacher. As I said, I was originally a studio art major in college. I did not have an interest in commercial art so I chose studio art. Well, somewhere along the line I realized that I might need a real job. They don’t call them starving artists for nothing! So I changed my major to education, with a minor in art. I love children and do not regret my decision. Teaching is an art of it’s own. Now, as a designer I get to travel around the country and teach quilting. I love the classroom so the transition to quilt teacher has been a very natural process. To put the title “Teacher” behind my name never ceases to make me happy! 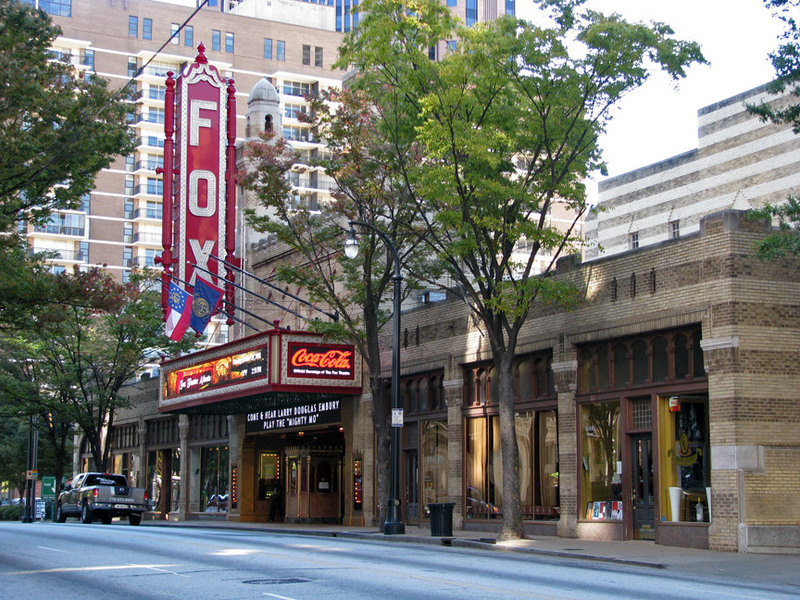 While I do not have a photo of me in front of the Fox Theater in Atlanta located on the iconic Peachtree Street in the heart of Atlanta, it is by far one of my favorite places on earth. 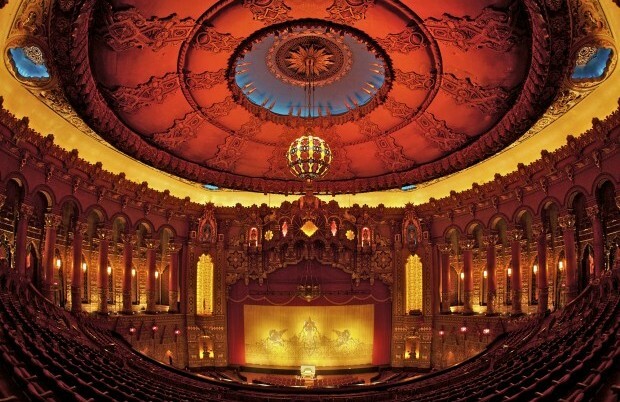 The interior of the theater has an Egyptian décor, rich, stunning and over the top! I love live theater in any form, from musicals to plays, concerts, magic shows, ballet you name it and I will get a ticket downtown and go to the Fox at any opportunity. When I was a little girl, my mother and aunt (who lived in Atlanta) would take me to the Fox whenever we visited Atlanta. If you come to Atlanta give me a call I will see what is playing at the Fox. We will take a spin down Peachtree too! 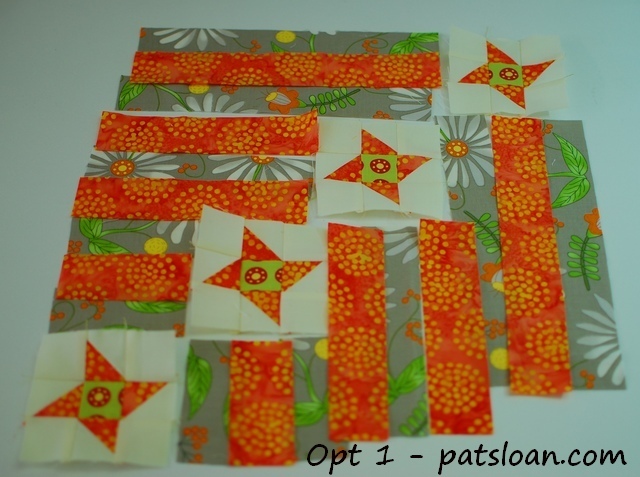 I think the one thing that helps quilters climb up the ladder of skill success and improve their quilting abilities is putting the practice of squaring up units, blocks and the end quilt after quilting using square rulers. I like to slightly oversize units and square them up after sewing. The process of doing this insures accuracy for sure! It is a check point along the way. Checking and squaring up a block after completion is another, and sometimes it is nothing more, than a “check” or giving the block a tiny hair cut! There is one more thing! I firmly believe that if quilters will make a prototype block prior to cutting and sewing the fabric for the intended project, we would eliminate a good bit of frustration when making the actual quilt. It gives us the opportunity to check pressing directions and so much more. I know it is more work, but can really pay off in the end. I like to put my extra blocks on the back of the quilt and even use them as the label!!! Do I have to have a favorite? Ok here is the truth. In piecing, 90% of everything I sew will use 2 shades of neutral, tan, and gray. I do have a light and dark tan also light and dark gray. So, for the basics of sewing that is it. I purchase the very large spools of thread which are never far away from me. 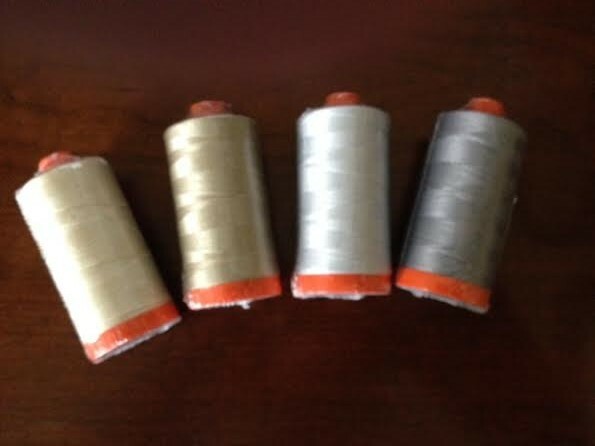 I have middle size spools (see photo) for travel. I keep a spool of black and white for the rare time that I absolutely need them. The fabric speaks to me on that choice. . The numbers I use all the time are #2310, #2324 which are the tan/creams, in the gray category I use 2600 and 2605. 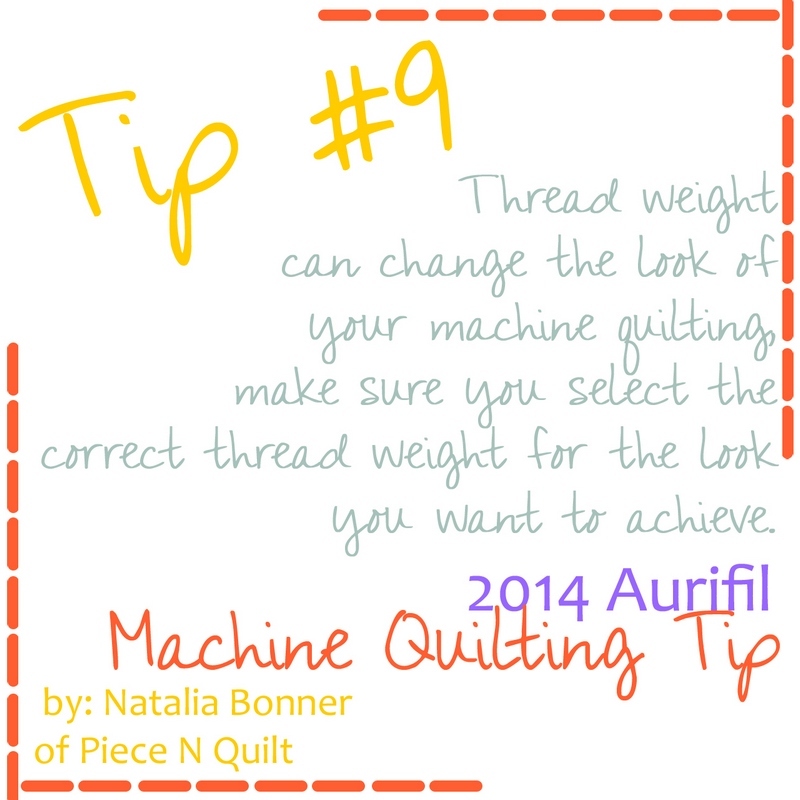 Then I have a thread box filled with small spools of Aurifil thread with tons of colors. 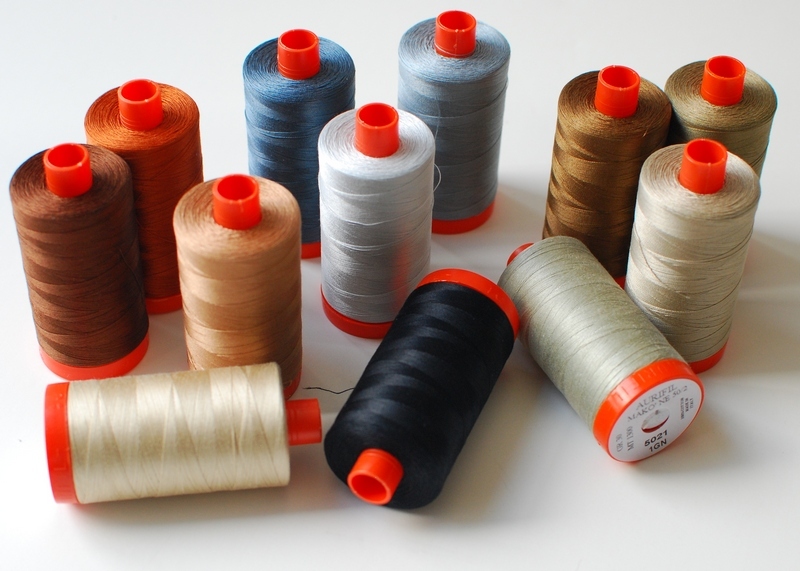 I would go to the thread box and use these for special projects, hand work, applique etc. I must mention that I do a lot of wool appilqué and embellishing. I use the Lana Thread and a TON OF IT TOO! It is soooo yummy. This is where I would match color to fabric/wool. Stay tuned to my blog and web site you will be hear a lot on this subject from me. Yes sir you will. My sewing room is wonderful. I am very lucky to have this space. It is spacious but cozy at the same time. I would like to say that while I love my sewing room I think fabulous quilts can be made in tiny spaces. 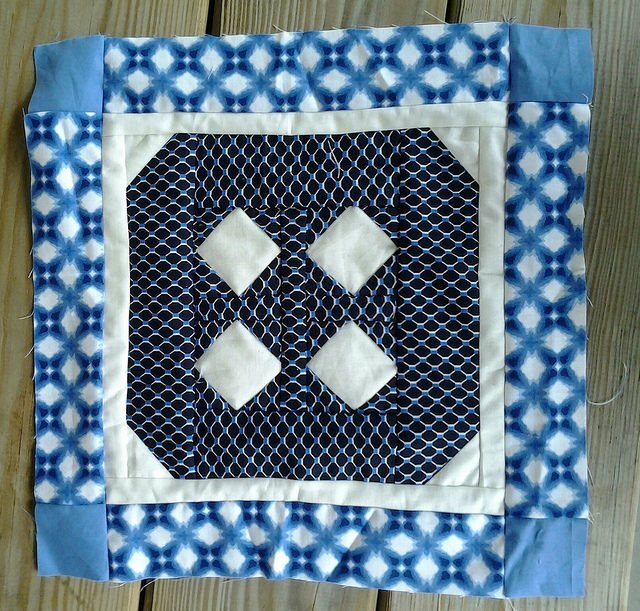 Let’s remember our great grandmothers made quilts with a needle, thread and a candle. Come with me I will show you my little heaven on earth. I like to be as tidy as possible. That doesn’t mean I don’t turn the joint upside down on a regular basis. I always tidy up a bit at the end of a sewing day and completely at the end of a project. I am a busy busy person so if I don’t stay on top of all this I would be totally nuts. (no comments please). The same applies to my home. I don’t enjoy sewing, sketching, painting designing etc. unless my home is in good shape. (I didn’t say perfect!). 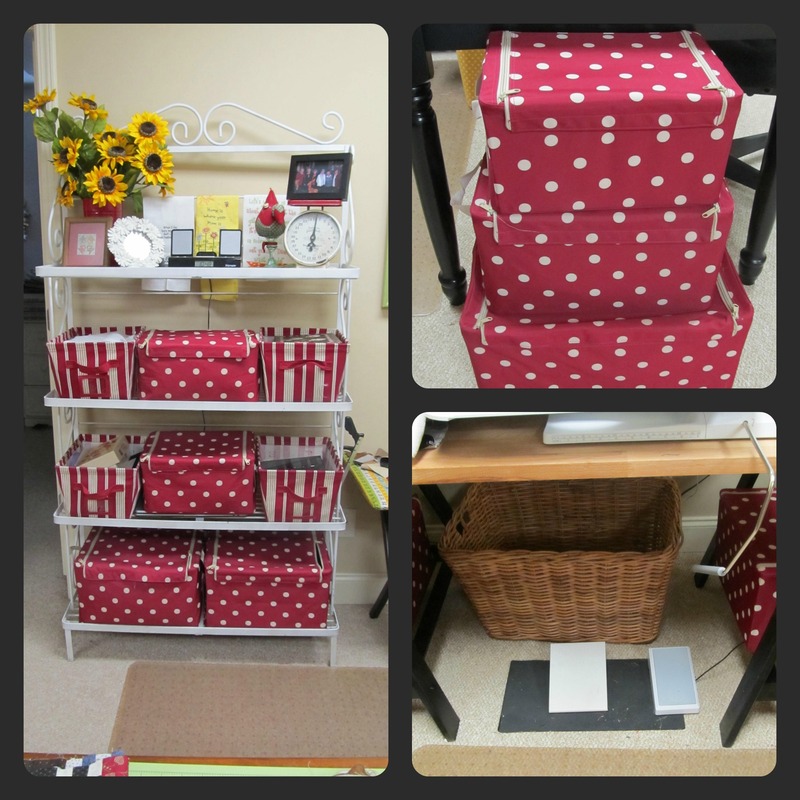 I am weird like that.This photo collage shows the baskets and trunks I use for organization. They make me smile! The polka dot trunks can be found at the Container Store. I am alllll about the polka dots. The baskets, most any big box store has them. The bakers rack was a find at an antique store and has glass shelves too! $50 bucks! The table where I sew is from Ikea, I painted the legs black to match the other tables in the room. See the polka dot trunks on the shelves under the table. More storage! The large basket usually has pillow forms and extra pieces of batting. 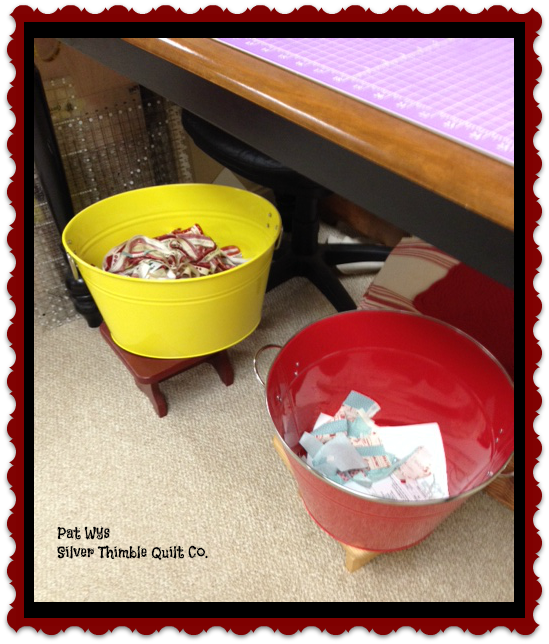 Here are my sewing and prep tables. I love the U format for sewing! I spin around in my chair all the time! Since I took this photo I added the Antique ball jars filled with buttons. I have a lot of buttons. I love it tucked into that corner Here are my cutting table and design wall. I have to say that design wall is the bomb diggity…LOVE IT. Under the cutting table I have two galvanized tubs (Target), one is for selvages and the other for cutting scraps. Here is my ironing station. Under the big board are drawers and I also store large graph paper and such directly under the ironing board. I go through a ton of graph paper. In back of the ironing is a chair and ottoman for hand stitching with my little lamp. I plan to cover the chair with the red check fabric you can sort of see over there in the corner. Through the door is the fabric fault. No photos I am pretty sure they can be used against me in a court of law. 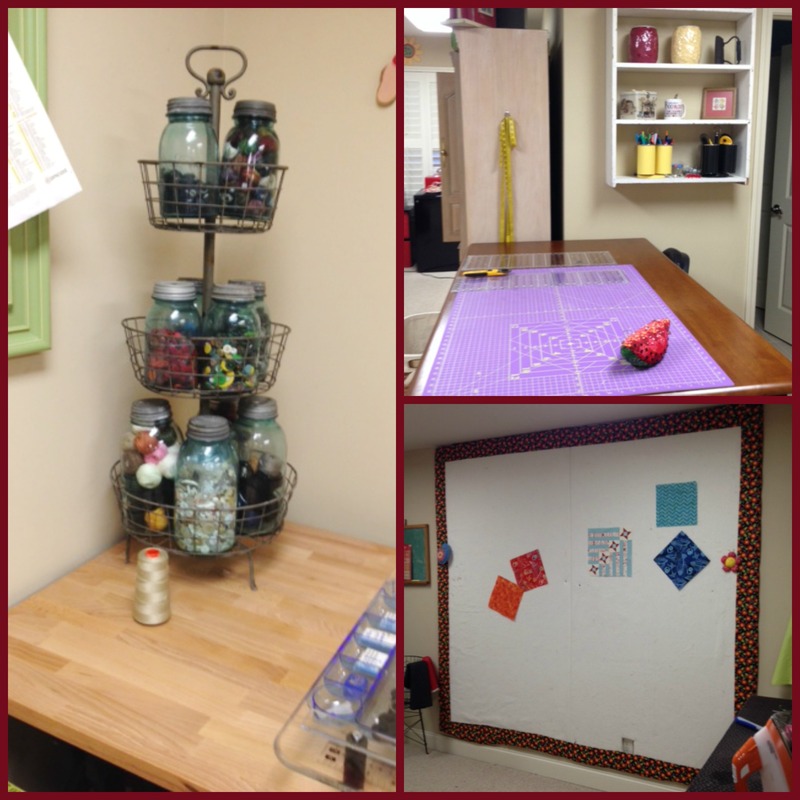 I bet you would think that the thing I love the most about my sewing room is my machine, design wall, fabric vault. Nope, it is this girl. Made for me by my dear friend BJ for display at market. She hangs over my sewing table and is the first thing I look at when I flip the lights on in the room. A constant reminder that quilting AIN’T all about the quilts! A ginormous part of quilting is in the friends and relationships we make along the way. Yes sir it is! I love this girl and even more the person who gave it to me. If you could train with, or work with, or follow one person for a day who would it be? Elly Sienkiewicz! I doubt I will ever undertake a Baltimore album quilt, but I know she could teach me a lot. I am a fan. However, I would love to follow Sue Spargo around for about 6 years, maybe more! I am a huge fan of her work as well. I have so much to share. How exciting is this? 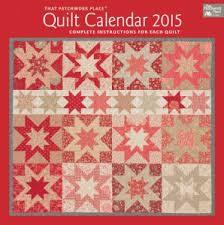 I have a quilt in the 2015 Calendar for Martingale. I was in the 2014 Calendar for American Patchwork and Quilting so that makes me a Calendar girl x 2. Wowzer. The calendar is spectacular and can be found on my web site. 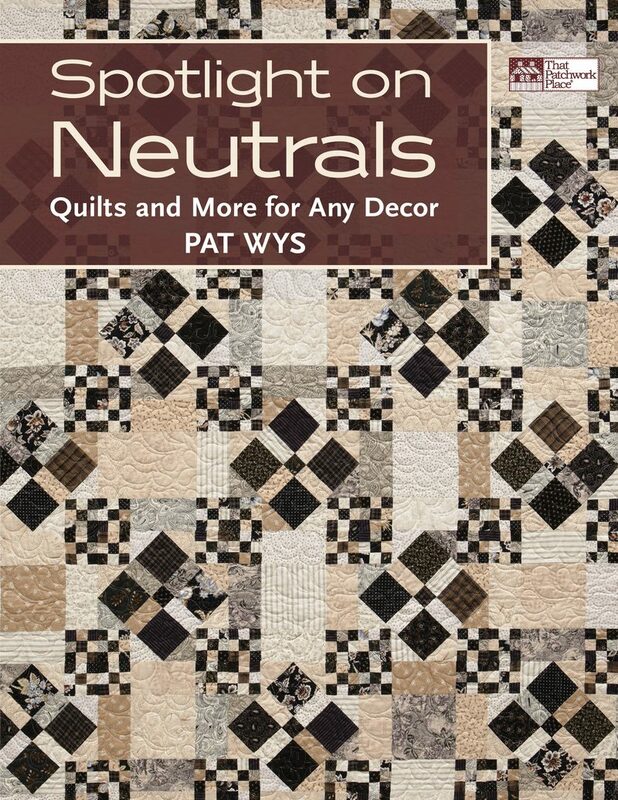 My third book with Martingale will be out June of 2015 and it is not about Neutrals. The book has tons of hand work, and wool appliqué. You just wait and see. I am super excited about it. 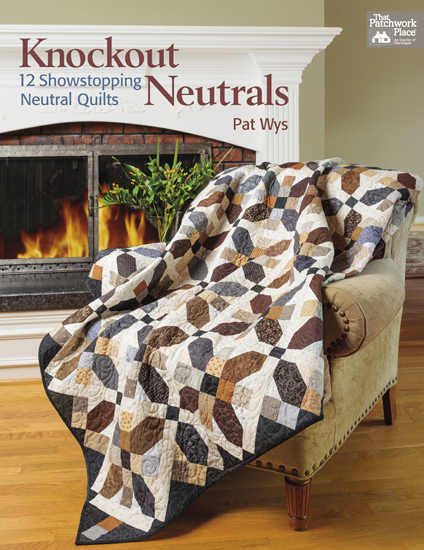 I will have a quilt in American Patchwork and Quilting December issue, which is terrific. Then big news! BJ and I have been designing 2 sewing themed projects. The projects are finished and the patterns will be out within the next couple of months. We also have a Christmas surprise. Super cute stocking patterns. All will be out soon so keep up with my website and blog. There is no way I could say just one. I purposely designed my block representing top 4 women who made me who I am. If you look at the block there are 4 Friendship Star units running diagonally through the block. They are the heart of the design! Let’s begin with the first unit, bottom left corner. That one is Kitty’s unit. 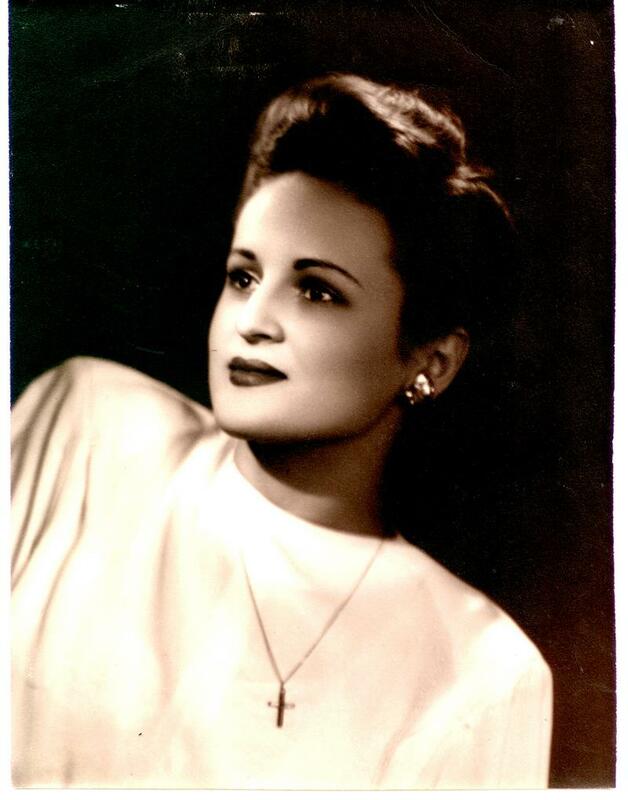 My paternal grandmother. She was an artist in every sense of the word. 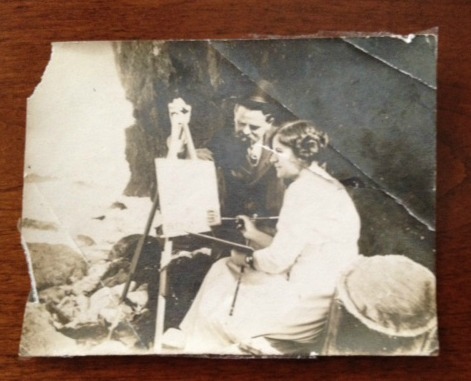 She painted, played and taught piano and played organ in the church every Sunday. She began my life long journey into the arts. I loved her dearly. I loved to visit her and she would always sketch and paint with me, we would sew and she tried to teach me to love to play the piano. Big regret in my life is that I didn’t pay closer attention to that!!! She was so creative. The second unit is my mother’s. What an amazing great lady of the South she was. She taught me grace, manners and how to entertain with style and charm. To say that she was beautiful is an understatement. She was a knockout! As a child I watched as she walked into a room and all eyes were on her. She oozed style and confidence. Cooking was an art to my mother as well, but the table was ALWAYS beautifully set even at the ordinary daily evening meal. She made home keeping an art. She was a CLASSIC. She gave me life and left her mark on me forever. I miss her very much. The third friendship star unit represents the girl that changed my life forever. My first born. Emily Jane! Charming, funny, beautiful, strong and caring. She made me a mother which is the best thing that ever happened to me. My world changed forever. She taught me to relax and just love…the rest takes care of its self. Here is a recent photo of Emily with my Son in Love Russ. These two are in love and recently had twins! I’m a GRANDY! They are so ready to become parents and I’m confident they will be great ones. She was pregnant in this photo. I think she glows what do you think? The fourth friendship star unit (top right) is dedicated to my second born. (there are only two), Mary Beth. There is no way I can say her name without a smile. Completely adorable. Beautiful, strong, hilarious in very way, one of the best humans I know. She is a nurse which makes her extra special. She is so laid back, goes with the flow for sure. She loves sports, and would probably rather watch a sporting event than most anything on TV. She made me a mother for the second time and my life would NEVER be complete without this precious, amazing young lady. She is whole package, I’m telling you that for sure. 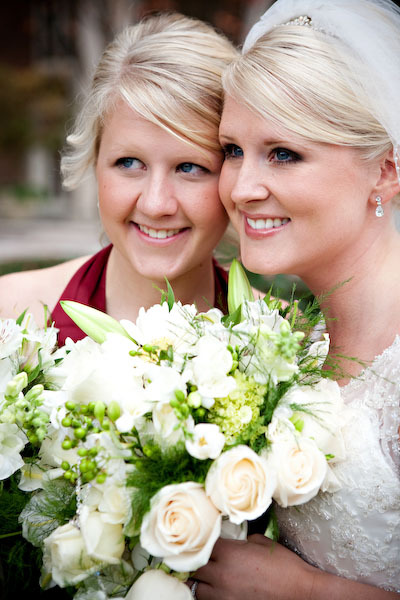 This is my favorite photo of both girls on Emily’s wedding day. There is my heart right there!!!! They are joy to anyone who knows them! The Book you are currently reading – I am in a book club of 6 great friends. We have been together for 13 years. We raised our children together and began the book club when the kids were seniors in high school. We have read so many outstanding books. We chose two books this month. Over achievers I guess. The first is Under the Wide and Starry Sky by Nancy Horan, and the other is Nothing to Envy by: Ordinary Lives by Barbara Demick. If you asked the “Bookies” what is our favorite book. You would get a variety of answers for sure, but I think the book we consistently agree that left a lasting impression was a book we read several years ago. A Fine Balance by Rohinton Mistry. Last Movie you Watched – Pride and Predudice…I swear for the hundredth time. I was sewing. I am a major Jane Austen fan. MAJOR! Your current favorite Song – “Happy” by Pharrell Williams….I can’t sit still when I hear that song. They were playing it in Sprouts Farmers Market and I was shakin it all over the store. I’m shameless like that! The snack you crave – Cheetos…nuff said. 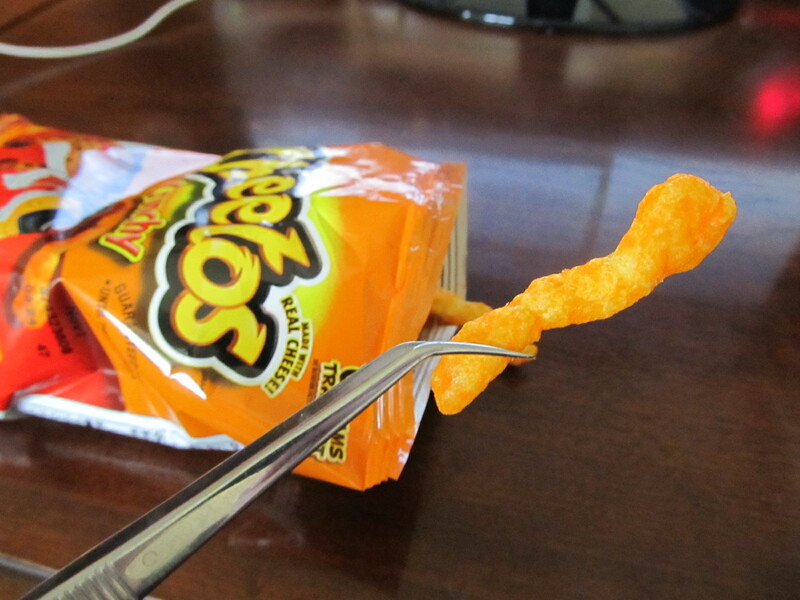 I SERIOUSLY use these tweezers to eat Cheetos while I’m sewing. We don’t want orange dust on my quilts right? Works for popcorn too! This is the truth cross my heart. The Color you have always LOVED…..I am terrible at choosing just one. I suppose it would be red, any red, all red. I love to mix red and orange, red and pink too. If it is RED it is good! Or maybe blue close second. Then there is green and yellow. Shall I go on? Why don’t YOU help ME decide which fabric combination will be my Sept block? CLICK OVER and tell me which one you like… In a few days I’ll share what ‘you’ decided! The winner this month is Marymackmademine! She wins a Thread kit! I KNEW I recognized her name!!! I am making her pattern, Glory Garden appliqué quilt! Love the September block.. thank you!!! Oh I love the September block and the meaning behind those stars! Thank you for sharing! I live just north of Atlanta and love the Fox also! Hahah! Love the cheetos tip! (I have a weakness there too…) What a gorgeous family you have Pat. Your Mary Beth looks just like your mom! Congrats on becoming a grandma!! Great tip I need a pair of tweezers! Beautiful family and quilts of course! Great interview, and great block! Thanks for the win. I’m SEW excited to have a new kit of thread! What a great block! And, thanks for your story. So, to enter, I need to make a Stars of My Life block and post it on Flickr, right? What is the deadline?